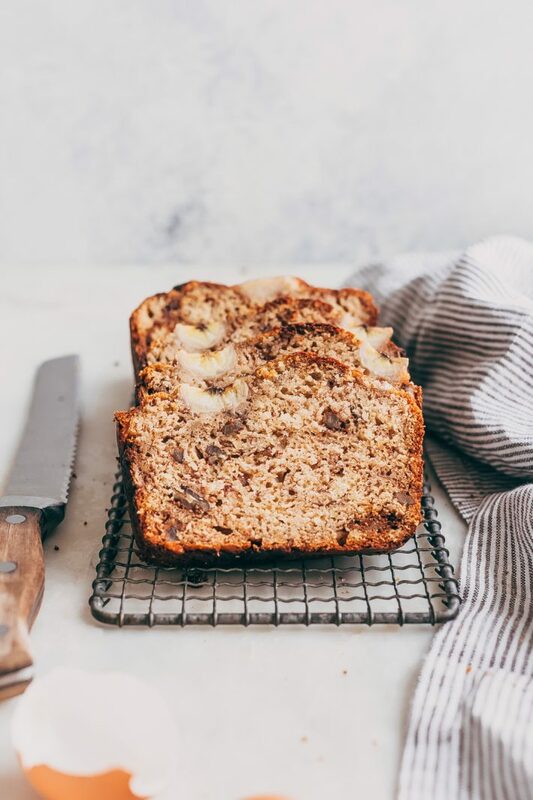 Brown butter maple pecan banana bread is loaded with all the things you love about traditional banana bread, but the flavors are much for elevated. Don’t worry; it’s super easy too! 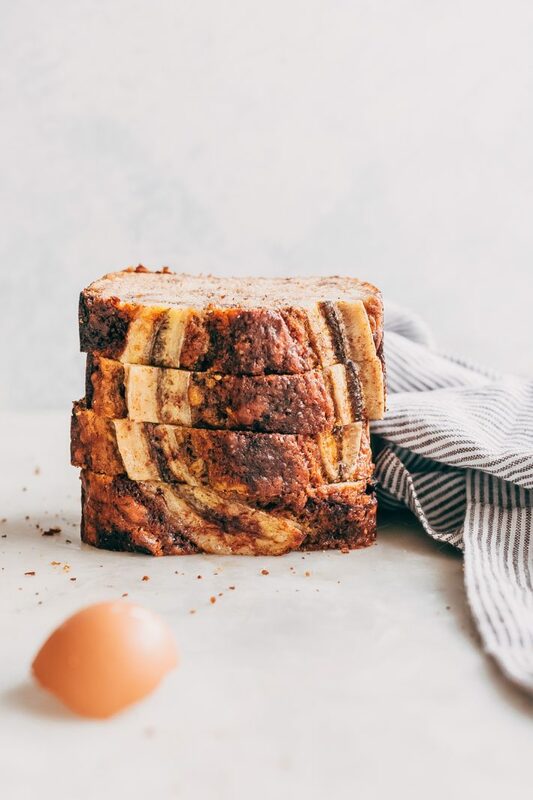 The more sophisticated, older sister to the basic banana bread. 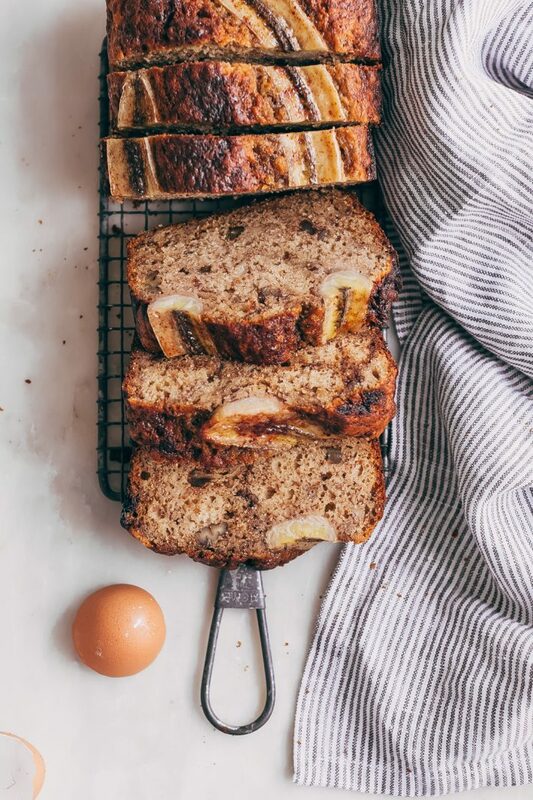 It’s maple pecan banana bread with brown butter, cinnamon, and ripe bananas. It’s finally Autumn! And this is how I’m kicking it off – by loading all the fall flavors into one loaf pan and making the most delicious brown butter scented maple pecan banana bread. I feel like a bear that’s been in hibernation just now coming out. This is absolutely my favorite food season. I’m overzealous at the grocery store. I see a bunch of bananas, and I think, sure, the two of us can polish off ten bananas in a week! That’s just a banana a day. Have we ever finished them off? NEVER. More times than I can count, on Friday’s I’m peeling speckled, ripe bananas, loading them up on a sheet pan and flash freezing them. They go into a ziptop bag and stay in the freezer with the rest of the ambitiously purchased, now ripe, bananas. So it was about time I cleaned out the freezer and what better way to do it then banana bread? 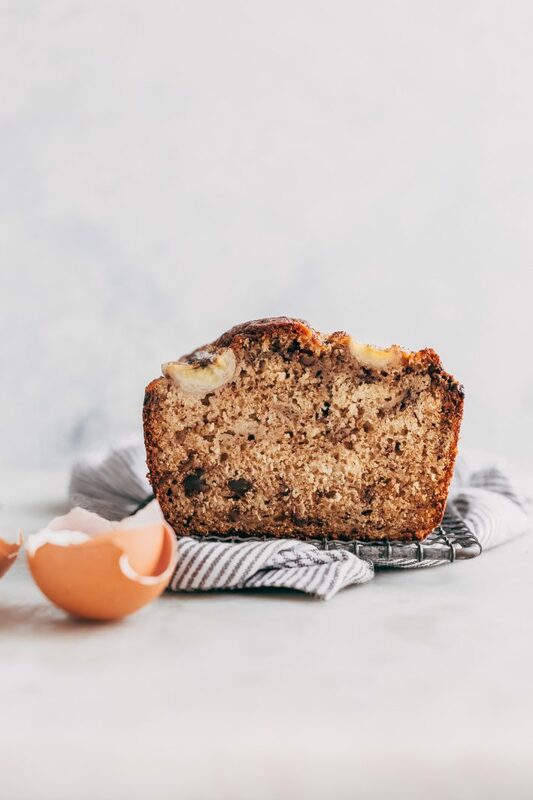 Todays naturally sweetened banana bread recipe is heavily adapted from the banana bread I’ve been making since I was about 15 years old. But with time, I started experimenting. Nothing too crazy at first. Just swapping the sugar for maple syrup and using pecans instead of walnuts. But this year, I wanted to elevate my banana bread game, and so I took a second to brown the butter. You know what, I must say, I’m probably never making banana bread without brown butter again. It adds the best caramel, toffee scent to the whole thing and my god is it delicious with a cup of coffee! use a thick-bottomed, stainless steel or light-colored saucepan. This allows you to monitor the color of the butter easily. Browning butter is a whole lot easier than it sounds! You’ll start with the sliced of butter in your saucepan on the stove and allow the butter to melt. Once it’s completely liquid, start swirling the saucepan gently so that all the browns evenly. You’ll notice that it starts to foam, keep going, you’re doing it right. Usually better quality butter has less water, which means it would brown quicker. Remove the saucepan from the stove when the butter smells like hazelnuts and looks light-medium brown. Slice the butter before adding it if you can; it melts more evenly. BE sure to swirl the pan occasionally, so that the butter browns evenly throughout. Let your nose be your guide! Once you smell a nutty aroma, take the pan off the heat and allow the butter to cool to room temperature. Before we left for Italy, I made a few loaves of maple pecan banana bread, and I kid you not, the whole house smelled with autumn. One thing I almost always like to add – ground cinnamon. It provides the most delicious, homey, scent to baked banana bread. I shared a few pictures on Instagram, and you guys were just as eager to make maple pecan banana bread as I was. I also like to add a pinch of nutmeg, but that’s entirely optional. 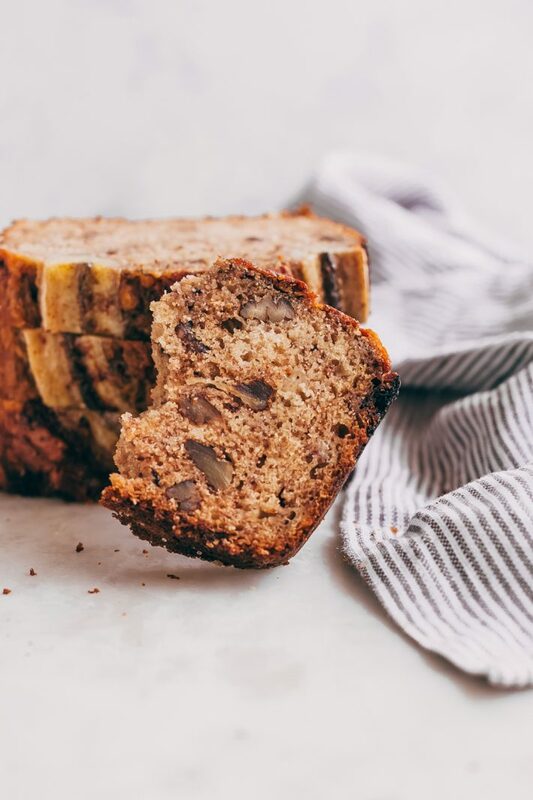 Nutmeg adds a warm and fuzzy fall touch to maple pecan banana bread, but you can certainly leave it out if that’s not your sort of thing. Regardless, your house is going to smell DIVINE when you bake this bread up. There are tons of variations that you can make to my maple pecan banana bread. If you’re not a fan of nuts (or are allergic) swap out the pecans for chocolate chips, currants, or raisins. You can also go a lot heavier on the spices! Pumpkin spice would also work well here with the browned butter, the maple syrup, and pecans. Besides, I’ve never met anything I didn’t like that contained pumpkin spice, so I imagine it’ll only make this banana bread that much better. Make the maple pecan banana bread. Once the butter is browned, this is a one-bowl recipe. 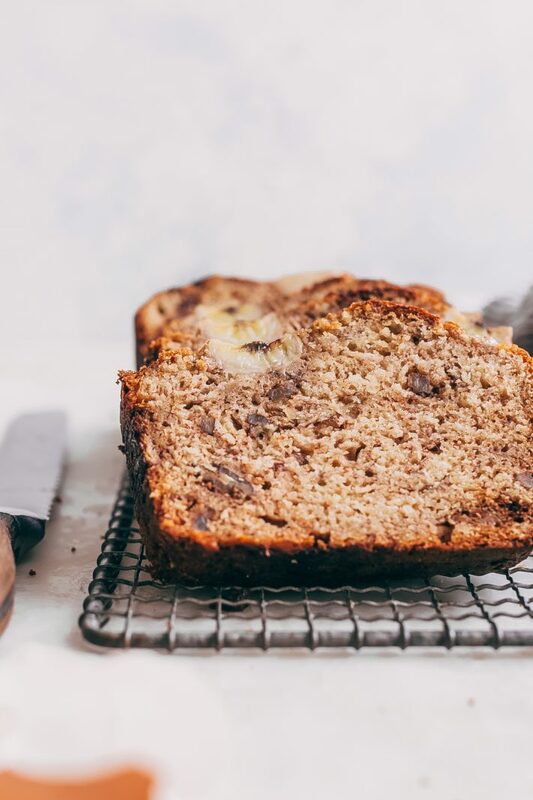 I repeat you can make this banana bread recipe in one bowl! AND you don’t need a stand mixer or even a hand mixer for this. Stir in the maple syrup while the butter has cooled slightly. Then we’ll add the remaining ingredients. Start with the eggs, and make sure to let each one mix in thoroughly before adding the next. Then come the vanilla and the mashed bananas. Then come the dry ingredients. There’s no need to whisk the dry ingredients together beforehand. Add the leavening agents and the spices first. You’ll need to add the flour in two batches for this alternating with the buttermilk. Make sure you don’t overmix the batter here. If you see a few lumps in the mixture, it’s okay; don’t worry about it! Then, just dump the batter in a greased loaf pan  (affiliate link.) I like to add a banana sliced down the middle on top purely for looks, and because I need to use up the last banana we had sitting around – true story! So the banana on top is strictly optional. Sometimes I’ll sprinkle a pinch of cinnamon or a teaspoon of sugar on top, but again, this is purely optional; you don’t have to do any of this. Allow the bread to bake until a toothpick inserted in the center comes out mostly clean. That’s it! 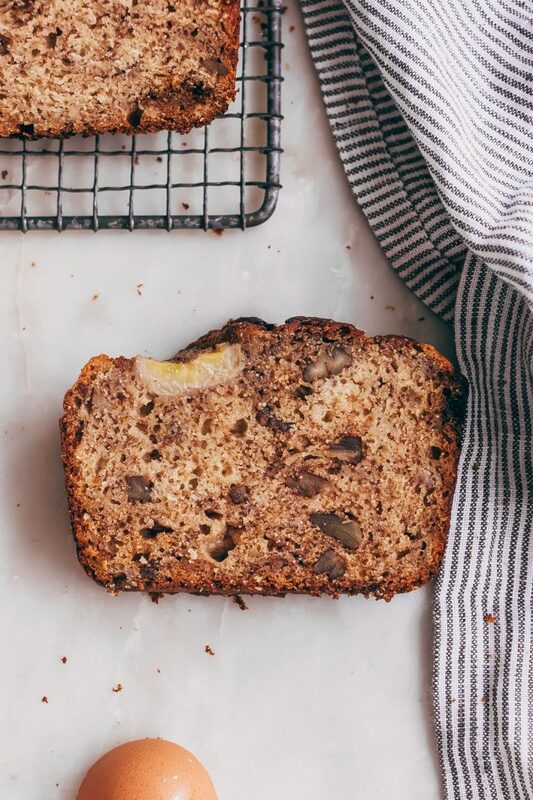 Easy breezy and so much more elevated regarding flavor than basic banana bread. Did I mention maple pecan banana bread is killer with a cup of warm milk or coffee? I mean, I’ve made it breakfast more times than I’d like to recount! 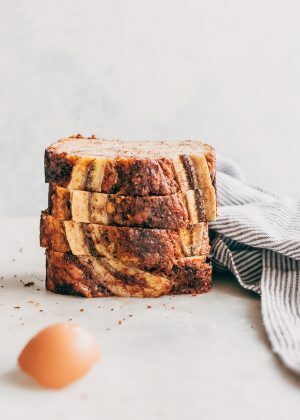 Brown butter maple pecan banana bread is loaded with all the things you love about traditional banana bread but the flavors are much for elevated. Don’t worry, it’s super easy too! PREP: Position a rack in the center of the oven and preheat the oven to 350ºF. Spray a 9×5-inch loaf pan with nonstick cooking spray. BROWN BUTTER: Heat the butter in a medium stainless steel saucepan over medium heat. Allow the butter to brown for a total of 3-7 minutes. Every now and then grab the handle and gently swirl the pan and stir often. You’ll notice it’ll start to foam but keep going. Usually, better quality butter has less water, which means it would brown quicker. Remove the saucepan from the stove when the butter smells like hazelnuts and looks light to medium brown in color. Pour into a large glass bowl and allow it to cool to room temp. WET INGREDIENTS: Once the butter cools, add the maple syrup and whisk to combine. Add the eggs one at a time and beat well before adding the next. Add the vanilla and the mashed bananas. Stir using a rubber spatula. COMBINE: Add the baking soda, baking powder, salt, cinnamon, and nutmeg and stir until well combined. Add ½ the flour, stir, then all the buttermilk and finally the rest of the flour. Fold until *just* mixed. A few lumps here and there are fine! Gently fold in the pecans. BAKE: Pour the batter into the prepared loaf pan. Bake for 55-62 minutes or until a toothpick inserted in the center comes out mostly clean. Let cool in the loaf pan for 10 minutes before transferring to a wire rack to cool completely. If you don’t have salted butter, just up the salt to 1 ¼ teaspoon in the batter.